Harold R. “Harry” Adams, 61, of Meriden, passed away Saturday, March 30, 2019, peacefully being surrounded by his family after fighting a 2 1/2 year battle with cancer. He was the husband of Connie (Magisano) Adams for 42 years. Born in Waterville, Maine, the son of Robert and Rena (Raymond) Adams, he was raised in New Britain and has been a resident of Meriden for 34 years. After graduating from New Britain High School, Harry joined the U.S. Marine Corps. Upon being honorably discharged from U.S. Marine Corps, Harry worked at New Britain Machine Co. until he began a successful carpentry business that he operated for many years. He was also well known as an avid golfer. In addition to his parents and wife, Harry is also survived by his two daughters, Samantha Adams and Kevin Sullivan of Meriden, and Christina Adams of Meriden; two granddaughters, Lacie Cox and Alyssa Cox; his siblings, Gerald and his wife, Merilea Adams, Brian Adams, Steve and his wife, Belinda Adams, Lynette Geiger, Joyce, and her husband, Wayne Breckinridge; his father and mother-in-law, Giuseppe and Lina Magisano; his brothers and sisters-in-law, Dominic, and Lorraine Magisano, and Frank and Cindy Magisano; his nieces and nephews, Jason and his wife, Laura Magisano, Nicholas Magisano, Dana and his wife, Natalie Adams, and Geoffrey Magisano; his great-nieces and nephews, Riley Jain Magisano, Nolani Adams and Daniel Adams. He was predeceased by his niece, Krystal Adams, and his grandparents, Donald and Doris Adams. The family would like to thank all the doctors, nurses, CNA’s at Yale-New Haven Hospital, and Smilow Cancer Center, and Masonic Care who took wonderful care of Harry. Funeral service will be held Saturday, April 6, 9:30 a.m. from the Farrell Funeral Home, 110 Franklin Square, New Britain, with a Mass of Christian Burial at 10:30 a.m. at St. Katharine Drexel Parish (St. Maurice Church), 100 Wightman Road, New Britain. 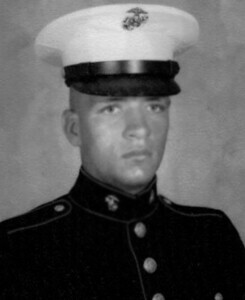 Military Honors will be after the Mass provided by the U.S. Marine Corp. Burial will be in the family plot in Solon, Maine, at a later date. Visitation will be Friday, from 4 to 7 p.m. at the funeral home. In lieu of flowers, donations may be made to Smilow Cancer Center, 20 York St., New Haven, CT 06510. To send a condolence, please visit www.FarrellFuneralHome.com . Posted in New Britain Herald, on Monday, 1 April 2019 20:02. Updated: Monday, 1 April 2019 20:04.